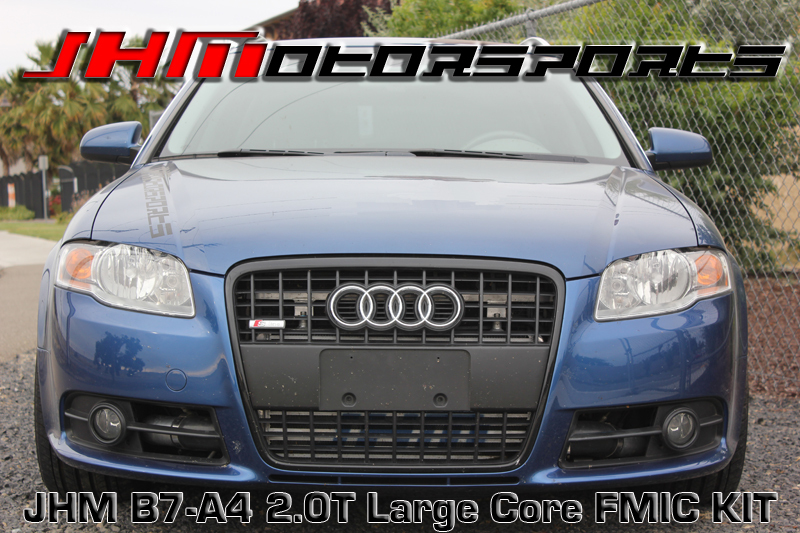 INTRODUCING THE JHM B7-A4 2.0T LARGE CORE FRONT MOUNT INTERCOOLER KIT!!! - Precision Fit MAP Sensor Hole featuring identical to OEM sizing ensuring the tightest fit possible. 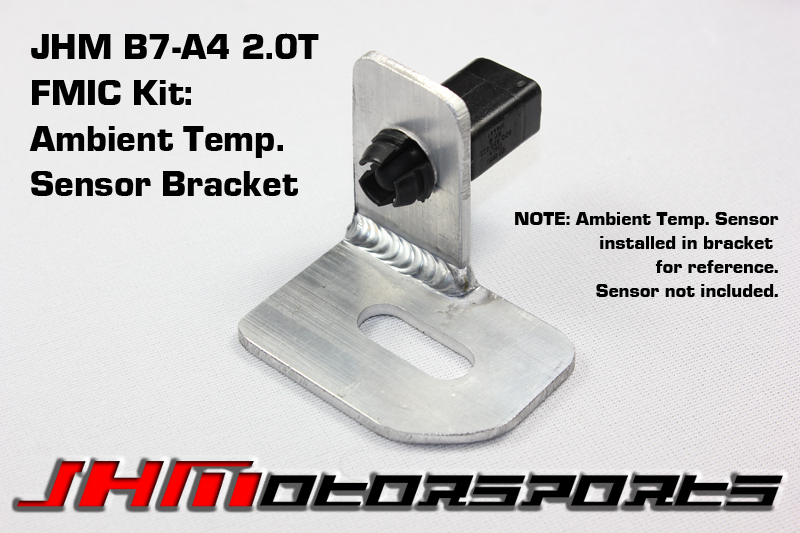 - JHM Ambient Temperature Sensor Bracket allowing for proper relocation of Ambient Temperature Sensor (Note: Ambient temperature sensor is NOT INCLUDED and shown for descriptive purposes only). - Customized end tank ensuring maximum clearance, the best possible fitment, and the most cost savings for a large core FMIC. The AC line connection on the lower portion of the driver side of the condenser prevents most larger, generic intercooler cores from fitting well. 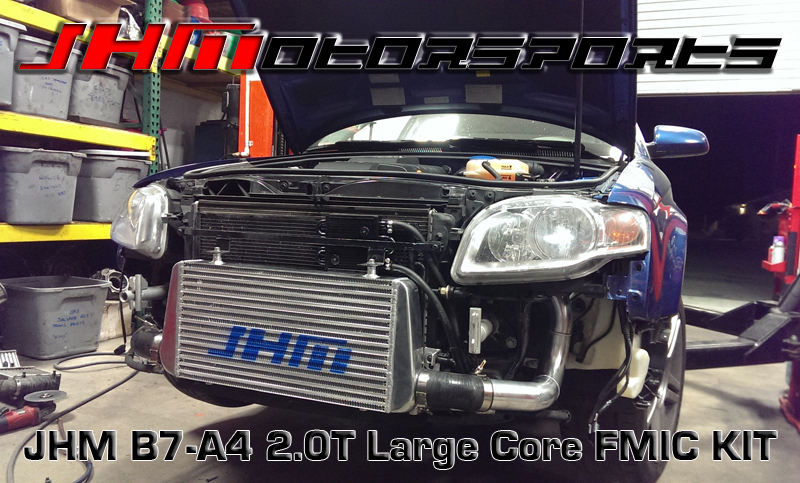 Our JHM Large Core FMIC has a customized driver side end tank allowing us to install a large core intercooler in the optimal location. 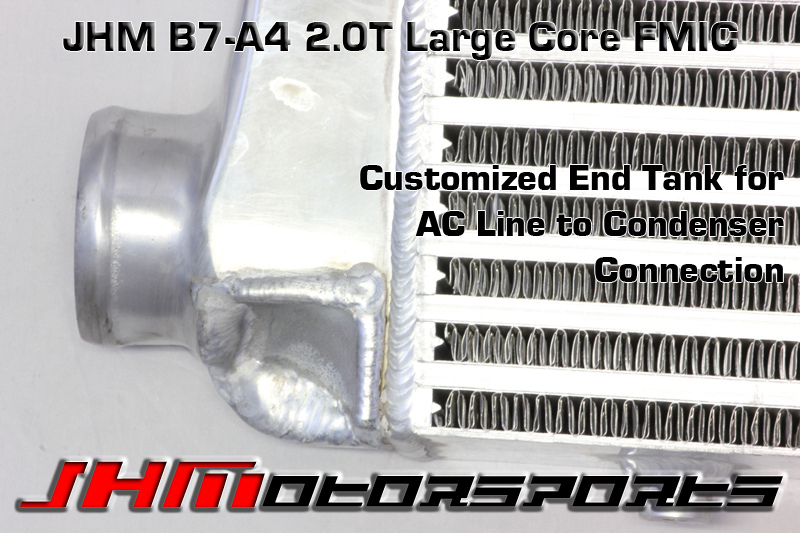 - The core in our FMIC Kit is 3 inches thick ensuring the best cooling performance possible. - Our kit also includes a replacement solution for your factory power steering cooler. Simply disconnect the OEM, clothes-hanger style line, install our high-quality hosing and mount our cooler above our FMIC core. - Finally, we also provide a complete hardware kit including everything you'll need for installation of the kit, including a large mounting bracket for properly supporting the large core. OPTIONS: Select your configuration from the dropdown menus below. - FMIC Piping Coupler Color: Couplers are available in Blue or Black. 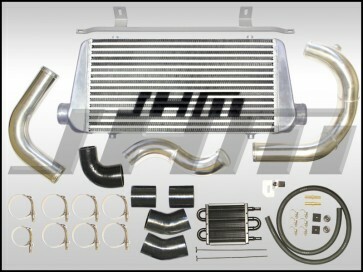 - Painted JHM Logo: Chose Blue or Black Logo to be painted on your FMIC core. 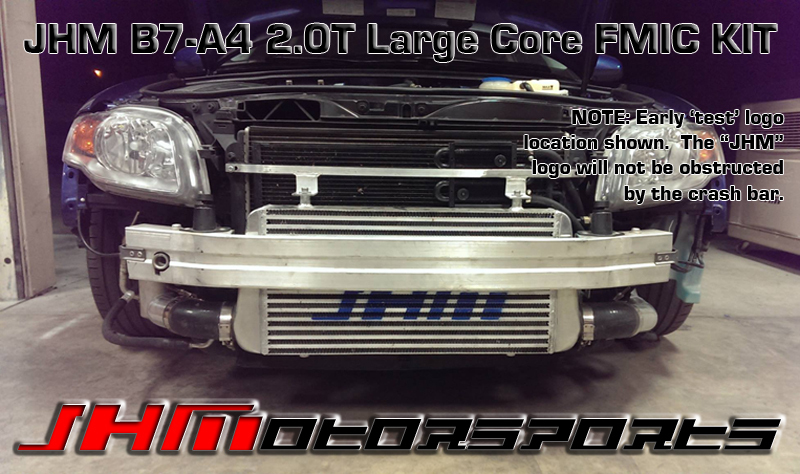 NOTE: The "JHM" painted on logo is located on the FMIC Core for optimum visibility on both Standard and S-Line bumpers/grilles once the core is mounted on the car. - Our Intercooler Piping is different between the K03/K04 and the JHM TD05H-R Big Turbo Kit. Please select the turbo you have. - 5x Silicone Couplers (2x Straight, 2x 45 degree, 1x 90 degree reducer) for FMIC Piping, Available in Blue or Black - select your choice below. Click HERE for pictures of the installation and fitment of this front mount. NOTE: In some places, these instructions show pictures of the smaller core kit. However, there is a supplement at the end of the document that will guide you through the large core portion of the installation. DISCLAIMER: Proper installation of this FMIC Kit will require modification of your factory bumper support or "Crash Bar"
By purchasing and installing this kit, you understand that you will have to modify your factory bumper support which was installed from the factory for safety. 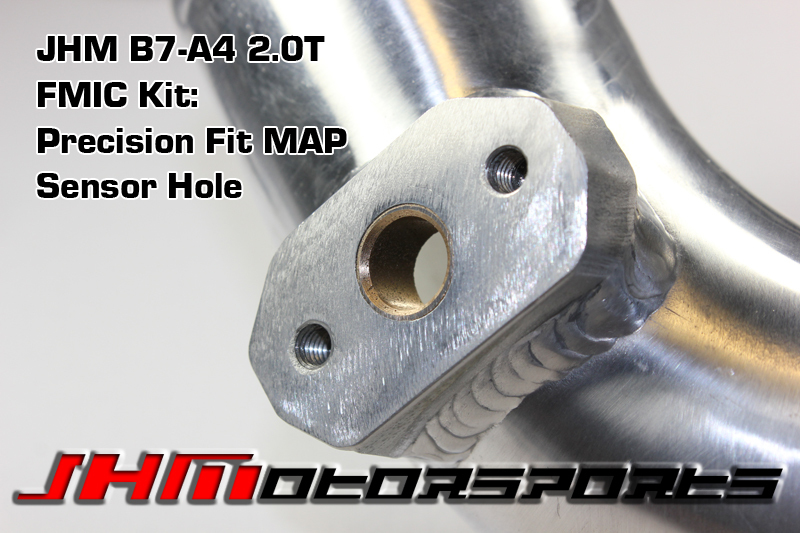 JH Motorsports, Inc. is not responsible for any damage to your vehicle or bodily injury in the event of an accident due to the modifications required to be made to the bumper support in order to install this FMIC Kit.